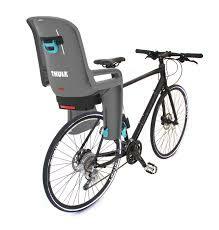 Take your child with you on family bike rides with this safe and easy-to-use bike seat. Universal quick-release bracket allows fast mounting and dismounting; it's also compatible with most bike frames. Adjustable padded harness provides excellent fit, comfort and safety. DualBeam suspension absorbs the bumps and shocks of the road. Tilt function allows five different reclining options. Foot straps and footrests adjust with one hand to fit a growing child. Childproof safety buckle quickly secures the child. Reversible padding can be detached for washing. Imported. Age recommendation 9 months to 6 years.